MENDEL investigated in his crossing experiments not only the characteristic colour in pea seeds (green and yellow), but also various forms of seeds (round or wrinkled), different sections of the stem (short or long) as well as different shapes and colors of the Fruits (pods). 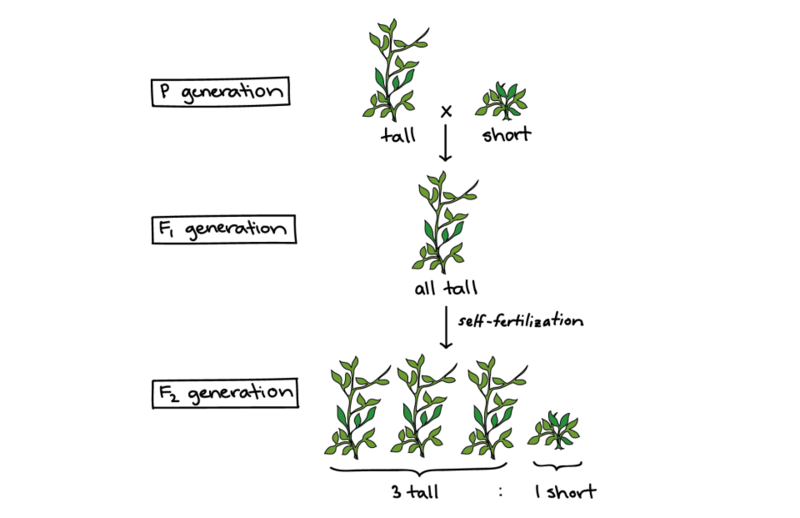 Mendel’s observations and results of crossing experiments are summarized in the Mendelian rules. The genotype (heritage image) is the totality of the genes of an organism. The phenotype (appearance) is resulting from the totality of the characteristics appearance of an organism. It is formed as a result of the interaction of genes (genotype) with the environment. A gene is a section on the chromosomes that is responsible for the training of a characteristic. Each gene exists in two alleles. Dominant (lat. (= dominare rule): an allele is more involved the training of a characteristic as the other. The characteristic dominant allele is dominant. Recessive (lat. (= recedere withdraw): the characteristic unterlegene (suppressed) allele is called recessive .